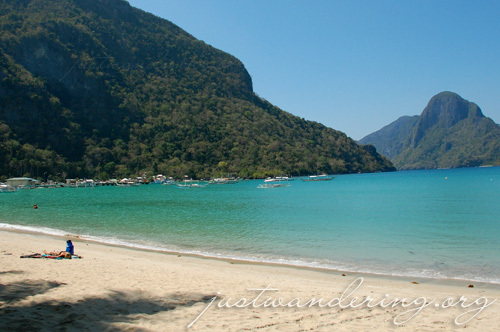 Southeast Asian Airlines (Seair) is only one of two commercial airlines that fly to El Nido. 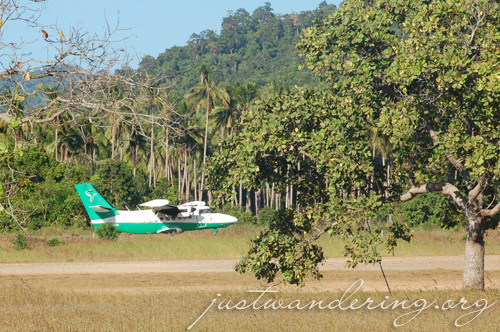 The unpaved runway of El Nido Airport limits the types of aircraft that can land there. Currently only Seair’s 19-seater Let-410, Island Transvoyager Inc’s (ITI) 19-seater Dornier 228 and the service helicopter of the Malampaya crew land and take off from their airport. I’m trying to think back why we chose to stay in Marina Garden Beach Resort, but all I can think about is how glad I was that we agreed to stay here. The resort has the best stretch of beach for lounging and swimming. Though most of the resorts in town have beach fronts or have access to the beach, Marina’s beachfront is the widest and cleanest, and hardly any boat dock on its shore, which makes it the best for swimming. That’s why guests of other resorts flock to Marina’s beachfront. It’s been more than 24 hours since I last used a computer. For me, that’s quite a feat. Though frankly, I think I ran up quite a bill on mobile Internet charges. It feels good to be on a holiday during a trip. Since I started travel blogging, each one of my trip started feeling like a great piece for the blog, not a vacation. I needed to take it slow and just sit back, relax and take in the beauty of the world around me. 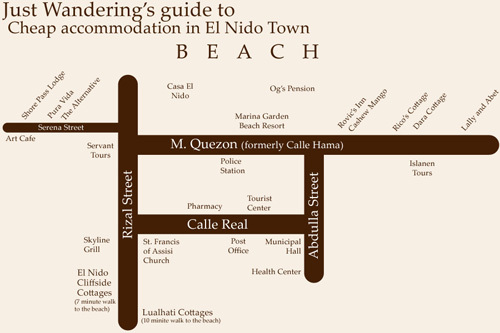 El Nido is the perfect place for that. 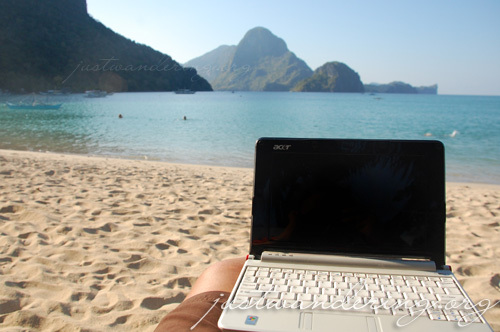 My workstation in El Nido. 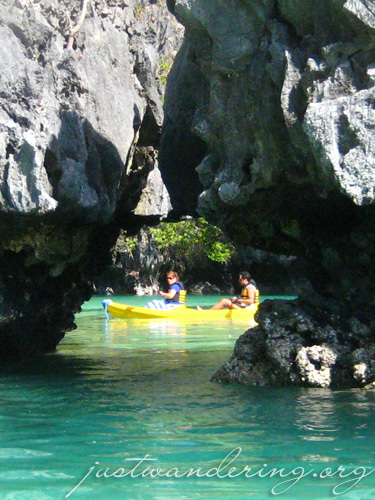 El Nido, Palawan is in most Filipino’s dream destination. It was also part of mine, and I never really thought I would one day be here. Of course, Seair played a big part to make it happen — we were given return tickets to the island for free. Seair offers seasonal flights to El Nido, twice a week. We took the Wednesday flight out of Manila, and we’re taking the Sunday flight back.